Add marshmallows and butter into a microwavable bowl. Melt in microwave on high for 1 1/2 to 2 minutes. Add cereal into marshmallow mixture. Melt caramel bits and pour over half of the rice kris pies. Cover caramel with other half of rice krispies. 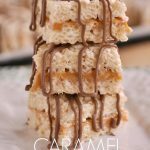 Caramel Rice Krispie Bars was originally written by Leigh Anne Wilkes at https://www.yourhomebasedmom.com/caramel-rice-krispie-bars/.